Measuring the time it takes to travel from one place to another has little bearing on determining how livable an area is. Instead, what really indicates the livability of a place is multimodal access to jobs and how easy it is to accomplish everyday tasks, such as going to the grocery store or exercising. The Commonwealth of Virginia evaluates this kind of accessibility by calculating how long it takes to walk, bike, or drive to and from public transportation stations; how reliable the public transit is; and wait and transfer times. These measurements constitute part of SMART SCALE, a statewide program that helps officials choose which transportation projects to fund to ensure the best use of state tax dollars. Proposals are scored based on an objective, outcome-focused process that is transparent to the public and holds decision-makers accountable to taxpayers. The backbone of SMART SCALE is Sugar Access, an ArcGIS extension from Esri partner Citilabs that helps communities analyze, manage, and visualize their transportation networks. Employing all their own local data on roads, highways, and public transportation systems, as well as census data, planners can use Sugar Access to discern how easy or difficult it is for residents of a certain neighborhood, city, or region to get to and from common places like work, school, stores, and parks. They can then use the program to conceptualize different transportation scenarios and figure out which ones work best for particular places. Prior to implementing SMART SCALE, Virginia faced two key issues when evaluating transportation plans. First, the state was using a narrow set of variables to calculate the effects that proposed projects would have on the connectivity between people and their destinations. It was simply routing vehicular trips through a street network, taking very little account of the fact that people use other modes of transportation to get to and from a place. 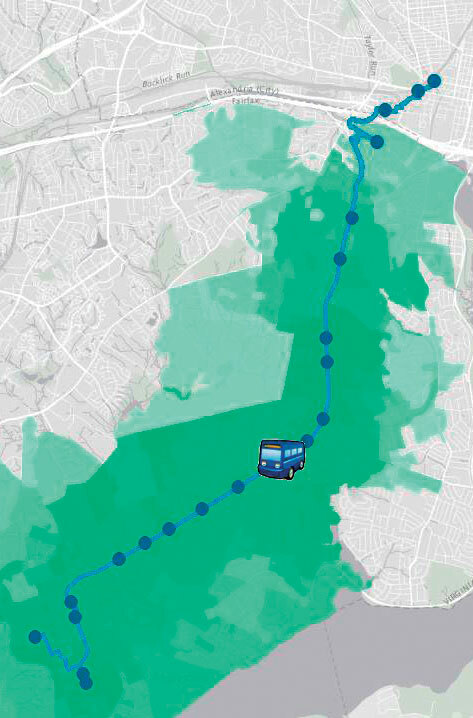 Renaissance did a multimodal analysis of how a new bus-only lane in Alexandria, Virginia, could increase residents' access to jobs. Second, Virginia had to hire a consultant to perform all this analysis. While this worked in general, it didn't allow local agencies to score their own projects to generate the maximum benefit for their communities. So the Virginia Department of Transportation (VDOT) partnered with Renaissance Planning Group to implement more robust accessibility measurements for each project across the state. For the 2018 fiscal year, VDOT selected Citilabs' Sugar Access as the standard tool for conducting the evaluations. With Sugar Access, planners can conceptualize, understand, and communicate the benefits of multimodal systems in a comprehensive manner. After compiling all the accessibility data, planners can save it in a geodatabase and publish it in ArcGIS Online to conduct mapping and analysis and share data with decision-makers or the public. Then, using the Sugar Network Editor for ArcGIS Desktop, they can create different transportation scenarios to increase the livability of an area—whether that means adding more bike lanes that lead to downtown or changing bus routes. "With the multimodal analysis capabilities of Sugar Access, changes in access scores are sensitive not only [to] transit service improvements, but [also] potentially [to] pedestrian projects affecting access to transit," said Citilabs' engineer Matt Pettit. "It was designed specifically to calculate all aspects of a transit trip: the time it takes to walk to transit, wait time, time on transit, transfers, and more." Being able to gauge potential transportation projects based on their ability to provide better accessibility—along with their safety prospects, capacity to mitigate congestion, likely environmental effects, economic development opportunities, and proposed land use—has enabled Virginia to judge transportation projects based on their merits rather than political wrangling. "Citilabs and their Sugar Access platform have been instrumental in our ability to help Virginia with [its] SMART SCALE program," said Renaissance Planning Group president Chris Sinclair. In fact, using Sugar Access—and conducting analyses concurrently in the cloud as opposed to subsequently on local machines—Renaissance was able to evaluate more than 400 projects in about two months just before the end of 2016. "By running the analyses simultaneously in the cloud, Sugar Access allowed us to evaluate twice as many projects as the prior year," continued Sinclair. "We were able to quickly get started with the included datasets and easily edit the transit networks directly in the program. This provided a tremendous flexibility to measure the impact of projects." With accessibility so easily scored, the Commonwealth Transportation Board is able to select the most advantageous transportation projects to fund. To learn more about Sugar Access, visit the Citilabs website or call 1-888-770-2823.